Inspired by a speech from last Thursday (http://psuc12.wordpress.com/), I decided to focus on mindfulness in education as a topic that I want to elaborate further. Mindfulness in education is not a topic widely investigated, yet it has a lot of potential to improve education. Because my last blog addressed the role of arts in school I now want to look at the connection between art as a subject in school and mindfulness. A Belated Happy Lunar New Year Everyone!!! I listed several ways to manage stress which included: getting enough sleep, exercising, talking with friends, avoiding looking at things with a microscope, taking a mental vacation, journaling, and the practice of mindfulness. There are many other methods for living a more peaceful life and I would love it if this blog could become a community of readers who share their tips. 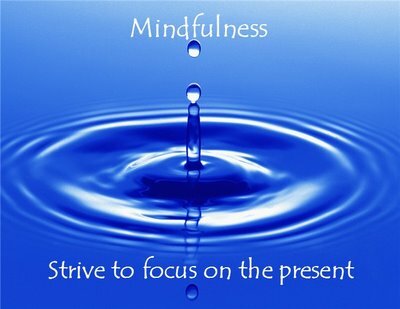 This week I am going to focus on the practice of mindfulness. Ten years ago mindfulness was seldom mentioned. In fact, it was a concept that was just beginning to take form in the therapeutic community as a mental practice with potential related to stress reduction. Around that time I was working at a mental health agency that was beginning to implement a new treatment model whose foundation was based in mindfulness practice. Along with a colleague I was asked to master the treatment model, lead a group therapy session with clients, and educate our staff so that their clients could benefit from this new form of therapy. All I knew about mindfulness was that is was a form of meditation finding it’s roots in Buddhism, and though it was practiced all over the world, was primarily an Eastern practice. I was honored to be asked, scared about the responsibility, but THRILLED at the thought of having such a cool job that I was actually going to get paid to learn how to meditate. Mindfulness begins with welcoming yourself in this present moment. Some people avoid mindfulness because they are too shy to meet themselves, fearing who they really are. This is what comes from listening to everyone’s voices but their own. We have nothing to fear and everything to gain by investing time in our own minds. It is the only place we can meet God and or our higher selves, and see the present moment for what it is without judgment. It is the only place we can make wise choices. Mindfulness practice is not about Nirvana. Practice is about strengthening the mind, just as going to the gym is about strengthening the body. Mindfulness is state of being. It’s about being in the moment. There is a difference between practicing mindfulness and mindfulness. Mindfulness is about watching your mind, your breathing, or whatever you are focusing on from an observer’s view; an observer with wisdom and compassion. Mindfulness is about describing what you become aware of one-mindfully and non- judgmentally. The practice of mindfulness is the practice of staying in the here and now. Marsha Linehan has said, “Our minds are like untrained puppies. We tell it to sit and stay…and it will for a moment and then run off. We must gently call it back.” This is the nature of our minds. This is what we are disciplining through practice. Through the practice of mindfulness, we become our master. A fruit of mindfulness is acceptance. Non acceptance is a source of great unhappiness. Therefore mindfulness brings peace. Formal mindfulness practice involves designating a period of time on a regular basis to practice. Informal practice involves randomly checking in to the here and now, and opening your awareness to what is present. Both are useful. Research linking the health benefits to mindfulness were based on formal practice. As little as 10 minutes a day has shown to be beneficial in as short of a time as two weeks. Surprisingly this 10 minute period can be broken up into two 5 minute periods. A Google search on mindfulness practice yields 10,200,00 results. When I have been able to maintain a formal practice, I feel balanced, more in control of my emotions, less reactive, happier, and more compassionate towards others. It sounds strange, but I believe my body responds in a unique way. I feel like my body, mind, and soul are cooperating for my optimal well-being. I re-posted an article written in December called, “Get Me Off of This Merry-go-Round.” If you missed it, take a look. Below is a Ted Talk on mindfulness for your viewing. Its well worth the 10 minutes it takes. At least once a month we will be exploring the topic of mindfulness and it is my hope that you will begin your own practice. 10 minutes a day is all it takes to both open and manage your world. This week I want to share a principle I was taught early in life by my father who was a successful businessman. “It’s management before the fact Barbie, it’s management before the fact,” he used to say. Little did I know those many years ago that daily I would be teaching my clients the principle of, “Do what you can do today, to make tomorrow run smoother.” A small effort in advance can make the difference between living your life in such a way that will optimize your energy…and knowing how you want to live, but not being able to make it happen. That’s a mouthful isn’t it? Let’s break it down. Take a minute and think about where you get your energy? Obviously we get it from sleep, food and exercise but from what other sources do we receive energy? The answer to this is personal and worth exploring. It could be from other people, hobbies, or learning to name a few. When you can identify where you derive your energy, you can plan how to incorporate this knowledge into your life. It’s also important to ask yourself what drains your energy? Again, to name a few possibilities; it could be those who invite negativity into your life, high expectations from yourself or others, or not planning your time effectively. Take a look at your list of what gives you energy and plan in advance, ways you can incorporate them into your daily routine. Eating healthy is an area people often have difficulty, but with a little advance preparation, is something that is very manageable. Breakfast, lunch, and dinner, plus healthy snacks planned in advance, prevents vending machine lunches, grazing, and fast food binges, not to mention, how it promotes stabilized blood sugar, increased metabolism, and over all improved functioning. I am a big fan of preparing healthy foods in advance so as to take the guess work (a big energy drain) and preparation out of what I’m going to eat, when lack of time is a factor. Making the most important meal of the day a.k.a., breakfast could easily get lost in the shuffle of the morning madness if it weren’t for my “Cozy Oats”recipe which follows. When I wake up, I go downstairs and pop a pre-packaged baggie into the rice cooker with four cups of water and turn it on. Then I go back up stairs and when I’m ready, it’s ready. What could be more perfect? 2. I use a rice cooker with a ‘keep warm’ feature to make the “Cozy Oats.” That way if there is any leftover, it can remain in the cooker for 2 days to be eaten when desired. Let me introduce you to my rice cooker. We are very close. Place all dry ingredients in rice cooker with 4 cups of water and cook. *Add 1/4 cup chopped prunes to dry mixture before cooking. Be a pioneer of peace by sharing your tips and recipes for “management before the fact,” by pressing the comment button in the top righthand corner.